Macarons and a kid-friendly treat here. Nice one. 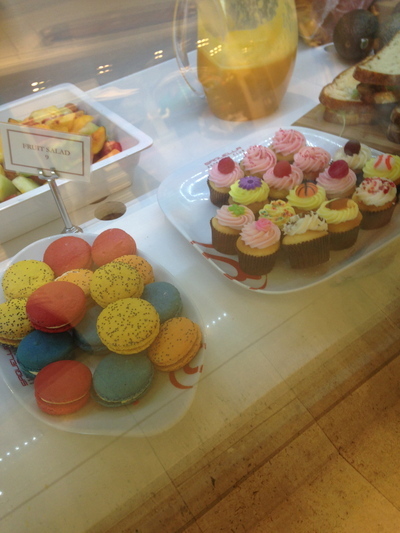 Yum, we love our cake shops and patisseries Sydney. Decisions, decisions. Where do you go to get your sweet fix? You can't really go past Zumbo's Patisserie - now in The Star as well as Balmain and Manly. World beating macarons, cakes that will impress anyone you're visiting with their delicate flavour and a lot of choice. For sweet breads, muffins, flourless chocolate cake and croissants, Bourke St Bakery is fantastic. Black Star Pastry is also good, and if you're in the city and want something French, you can't really go past the vanilla slices etc at Becasse Bakery in Westfield Pitt St Mall. For chocolate brownies in the city - Sweet Infinity at the Strand Arcade. That fudge like centre. Yum, and so filling. Laduree is great for their macarons. I like Cest Bon in Rozelle, and Pattison's in Mosman. Arras Too on Clarence Street has some of the most delectable sweets you could come across. Simply incredible! Mcintosh's Patissery in Forrestway Shops on the Northern Beaches is not that well known but it is great for cupcakes, sweet delicacy's and cakes. Their service is friendly and their coffee is amazing. Best health food store in Sydney? Best place to buy gluten free groceries in Sydney? Is Sydney a fast paced city? Do you like/use the new Opal card in Sydney? Best place to buy salads in Sydney? Best water park in Sydney? Do you want to live with your boyfriend? How to deal with culture shock in Sydney? Where to shop for clothes in the Hills District? What are the must-try foods in Sydney? When is the best time to visit Sydney? Where are the nice suburbs to live in Sydney? Which is the best tourist attraction in Sydney? Where is the best place for the ANZAC Day Dawn Service? Does your family go to the Easter Show every year? What are the best family friendly Sydney beaches?